Turkey Day is fast approaching so I was tempted to share a simple but tasty fruit salad that’s easy to make and fun to take to the cousins. But in the event the cousins are all staying at YOUR house and they don’t want Jello for breakfast I thought this recipe might carry your team further. Hunting season in SoDak has brought friends from far away near (as in poor souls sleeping on the couch because we don’t have enough beds.) Consequently, I”ve been looking for ways to feed our overnight guests. I stumbled upon this breakfast dish that is simple yet extravagant. My first attempt at a DoAhead version was fair at best. But I’ve worked out the kinks. 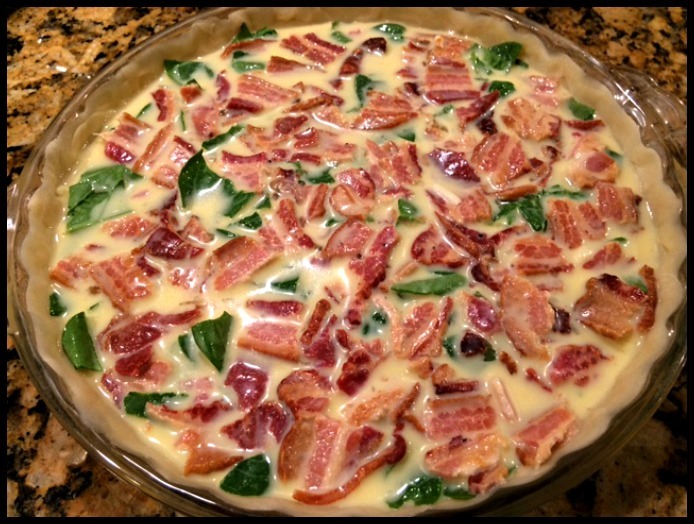 So, without further delay here’s a DoAhead breakfast dish you and your guests will love. I did a cheat and purchased some Pappy’s frozen pie crust. 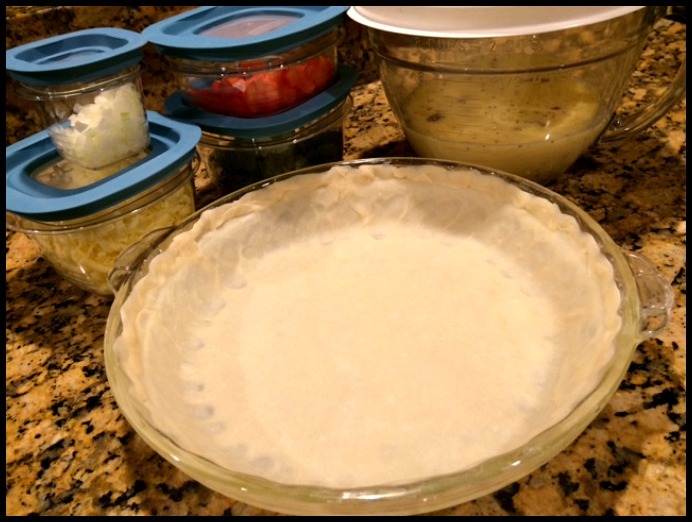 Once thawed I rolled it out, pressed it into the pie pan and then covered it with Saran Wrap. 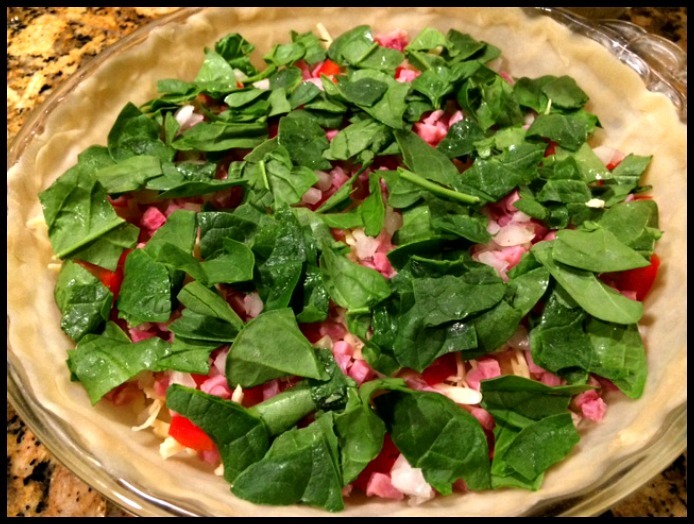 Next I prepped all the other ingredients and placed them in small containers (Bacon, Ham, Cheese, Onion, Peppers, Spinach). In another container I combined the eggs, milk and spices. The next morning (as I blearily groped for coffee) all I had to do was place the dry ingredients in the pastry shell, pour the egg mixture over top and then bake. You’ll need to cook it uncovered @ 425 for 15 minutes and then @ 300 for another 30 minutes. You’ll know its done when you insert a knife and it comes out clean. It’s very important to let it cool for about ten minutes before cutting. If you don’t the contents will “spill” onto the plate…still tasty, just not so pretty. Voi’La Sweet DoAheads! 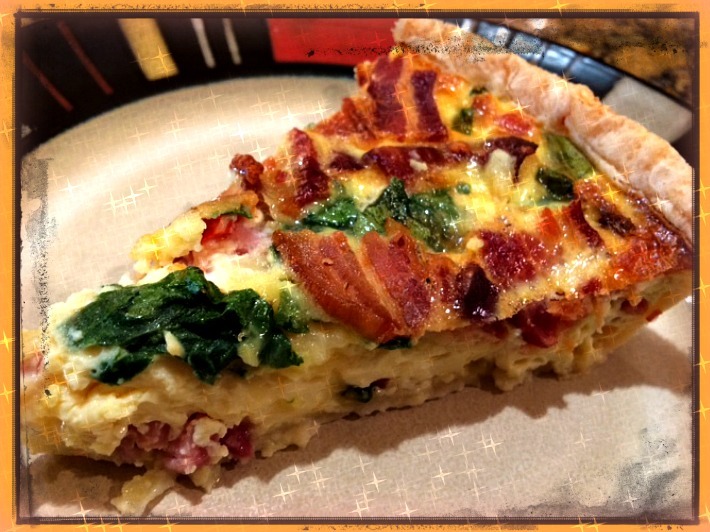 Quiche Lorraine (not to be confused with her sister Shirley) has joined your breakfast table! This recipe comes from the 1982 seventh printing of the new (I’m smiling.) 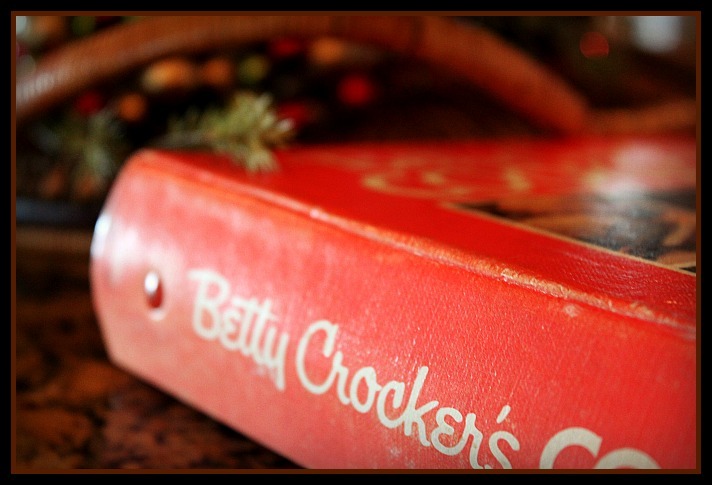 and revised Betty Crocker cookbook. My sweet Mom gave me the book for Christmas in 1983. Her exquisite handwriting still graces the inside cover. I’m pretty sure that’s one of the reasons this Quiche is so darn good. If you have a houseful of guests this Thanksgiving try this DoAhead——–before you go to bed at night set out the clear plastic plates, some festive fall napkins, a loaf of banana bread from the freezer and most important-set the timer on your coffee pot. Next Wednesday DoAhead Dining will share a few basic, but key tips for pulling off the most stress free, organized Thanksgiving Dinner ever!